Every few months the display of Asian art works on paper in the Arts of Japan Gallery has to rotate out with new works to preserve the quality of ink, colors, and paper of such light sensitive pieces. 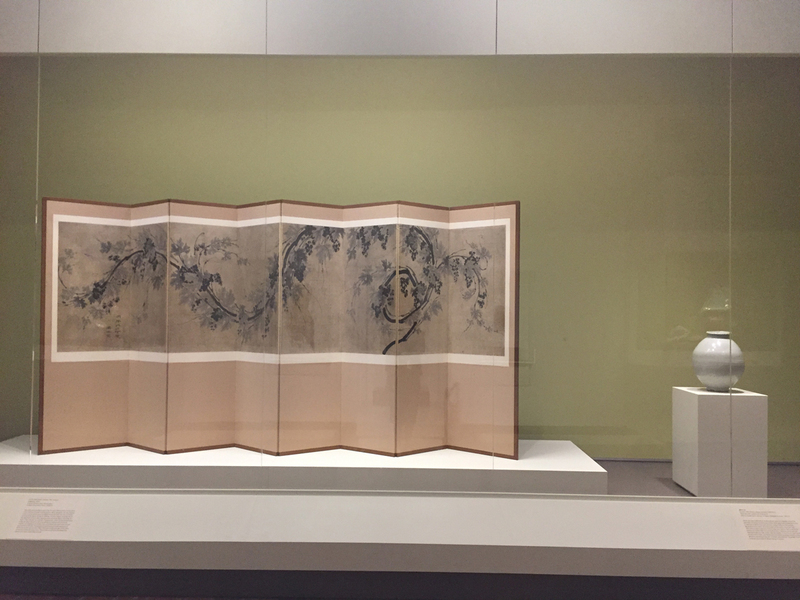 Working together with the museum’s dedicated team of conservators, exhibition designers, and art handlers, we recently completed the new installation featuring two outstanding works of Korean art from the collection, the eighteenth-century Moon Jar and the early nineteenth-century screen ink painting, Grapevine, by Choe Sokhwan. The spontaneous virtuosity of the brush that dances across the eight panels of the screen complements the quiet simplicity of the pure white moon jar. Yet don’t forget to also look closely and notice the moon jar’s imperfections, such as its asymmetrical form and the slightly bulging seam in the middle that were created during production. Rather than trying to conceal such “imperfections,” these characteristics are highly-prized for the elegant naturalness they add to the moon jar. Enjoy these new works on view on your next visit to WAM!